A session style brown ale that has lots of subtle flavors; like walnuts, cedar, caramel, cocoa and dried cherries. We made this beer for when you want a richer flavored beer that goes well with dinner and after. I contacted Jamie Robinson at Boxcar about a charitable craft beer event that we are having at Holy Saviour Parish. One thing led to another and I ended up helping out at the brewery one afternoon for bottling day. I was very impressed with the brewery and the beer. Everything is done well and old school. There is no forced carbonation, everything is bottled and keg conditioned. At the end of the afternoon Jamie gave me a few samples. I was very impressed with this beer at the brewery and now I can’t wait to give it a full review. The beer pours a slightly hazy dark amber almost brown with deep ruby hues and a fairly rich off white to tan head. The nose is delightful with dark malt aromas of caramel and notes of sweet chocolate and dark fruit. With a gentle swirl of the glass there is a release of the most pleasant floral hop aroma. This is an extremely inviting nose I can’t wait to dive into it. OH My, that was good. It’s amazing how refreshing this beer is with all of these flavors. Let me attempt a better play by play. The experience starts out with a caramel malt sweetness up front then a nice effervescence and earthiness during the middle of the sip. The back-end is smooth and easy drinking. There is a release of carbonation during the swallow that makes the flavors going down. The finish is where this all comes together. The finish is full of caramel malt flavors and earthy floral hops. This is a perfectly balanced ale; the hops are just enough to dry slightly without bittering but at the same time the malts are holding there own to the end. There is a slight malty aftertaste with some lingering yeasty notes. This may fall into an American Brown category but the earthiness of this beer reminds me more of an English Brown with hints of an Irish Red. This is truly another “original” from Boxcar. Well, I did not make the same mistake that I did reviewing the Boxcar Original Ale review. I chilled 2 of these for the review. See even I can lean from my mistakes. And it’s a good thing because this is so refreshing the first glass is almost gone already. Of course we started this off around 40 to 45 degrees. We are now at 61. All of the flavors seem to be a little more pronounced now. Man, I really like this one. There is also a lingering caramel malt buildup throughout the mouth. This is similar to a stout but with sweeter caramel malt flavors. I’m not a hop head and do not care for the overly bitter American IPA’s. However I appreciate the subtle hop flavors in this ale. Even now on the finish and final aftertaste there is just a subtle hint of the most pleasurable earthy and floral hop flavors. This really is impressive. This is another one of those simple but elegant beers. Did I say how much I’m enjoying this? The end of that first glass did have a slight robustness to the malts. It was not bitter or offensive in any way just noticeably more robust as it warmed and opened up a little. Well, I’m not sure if you can call the sediment on Non-Belgian ale lees but I thought I would give it a try. In this case it’s not bad at all. There is just more yeasty flavors. I hate to sound like a broken record but I have to re-iterate one more time. DO NOT pour the lees or sediment from the bottom of a bottle conditioned bottle into your beer. I just tasted the lees which I just said wasn’t bad and then tasted the freshly poured glass. There is a difference in these two tastes and the fresh glass is much better than the lees. It is very noticeable now that the lees mask a lot of the malt flavor and sharpness to the ale. The lees have a noticeable chalky quality to it now. You really have to do this back and forth test to see this for yourself. Before I get negative comments this does not apply to the non filtered wheat beer sediment. That should be swirled up and poured into the beer. 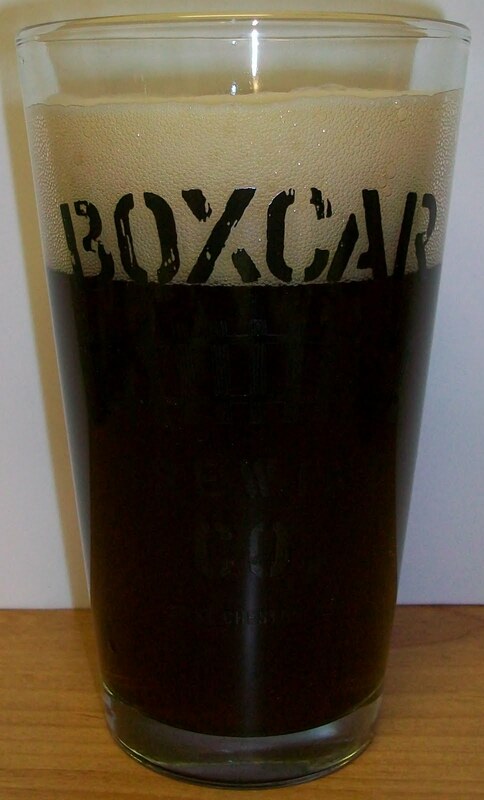 I hope the guys at Boxcar don’t mind but I poured the second beer into what I think is a more appropriate ale glass. Sorry, tumblers are my least favorite beer glass. Man-O-Man is this enjoyable. There is also a nice little head that is sticking around on this second glass. This is adding a nice creamy mouthfeel to the experience. The lacing is pretty impressive in this ale glass. I really didn’t pay much attention to the lacing in the tumbler. I don’t think there is much more to say about this ale. I’m going to drink this second one while I work on my final thoughts. The rating for this one is slightly difficult. No, it’s not that I didn’t like it. It’s that I always try to rate based on the style. 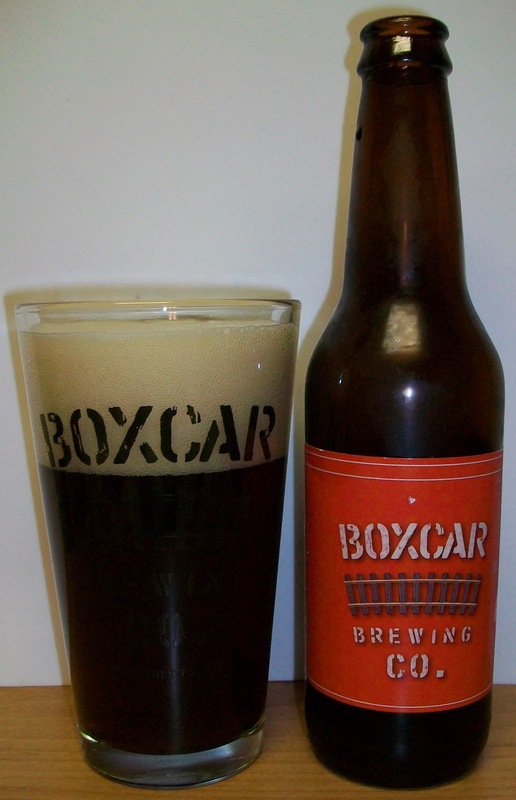 This is another unique beer from Boxcar that is really in-between styles. Beer Advocate and RateBeer both have this as an American Brown. To me this drinks more like an English Brown Ale but without the hard water taste. So I’m going to rate this as an English Brown. That will be comparing this to beers like Newcastle Brown Ale, and Samuel Smith's Nut Brown Ale not the typically more robust American Browns. I’ll take this ale over any of the English browns any day. It is certainly better than the ones mentioned above. Plus I’m a sucker for a beer that finishes well warm. This beer at room temperature was just as smooth as it was cold. Just a little more robust but there was noting unpleasant whatsoever. I’m going for a solid A on this one; another refreshing original from Boxcar. This is an excellent medium bodied refreshing Brown Ale with a delightful caramel malt nose with notes of chocolate and dark fruit esters, well balanced medium bodied with soothing caramel malt flavors and the most pleasant earthy floral hop finish without bittering. Drinks more like a refreshing English Session Brown with a touch of Irish Red character. Hat’s off to Jamie and Jason at Boxcar for another outstanding offering. This is another beer that should appeal to any beer drinker from the novice lager drinker to the craft beer enthusiast. I can’t wait to see what they come up with next.